In life, it is important to be spontaneous. 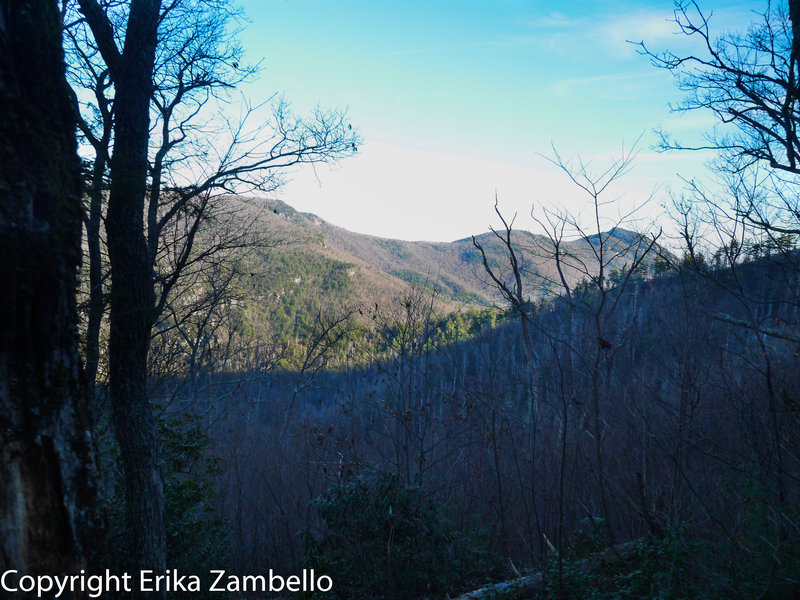 I am a planner by nature, but this past weekend decided to let my spontaneity fly when my fiance Brian suggested a camping trip to Linville Gorge. Considering it was already Saturday morning when we made the decision, “spontaneous” is definitely the right word! 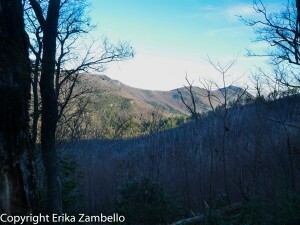 Our destination in Linville Gorge was definitely wilderness. We lost cellphone reception as we entered the dirt road leading to the hiking paths. Multiple pull-offs indicated trails, but we passed most of them. Pulling into a small lot, there was only one other car, whose inhabitants we never saw. 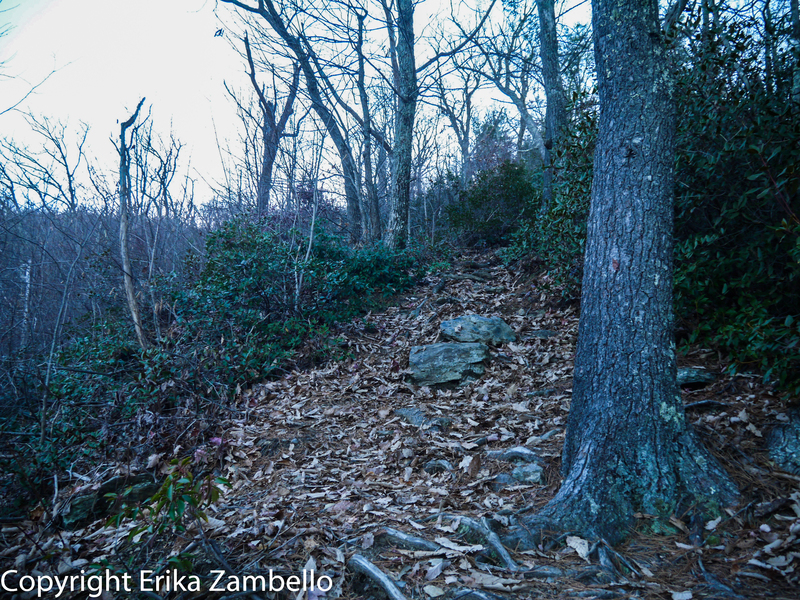 As we began the descent down the trail, the trees gave way and I could see the mountains that surrounded us, as well as the steep incline. When I say steep, I mean steep. 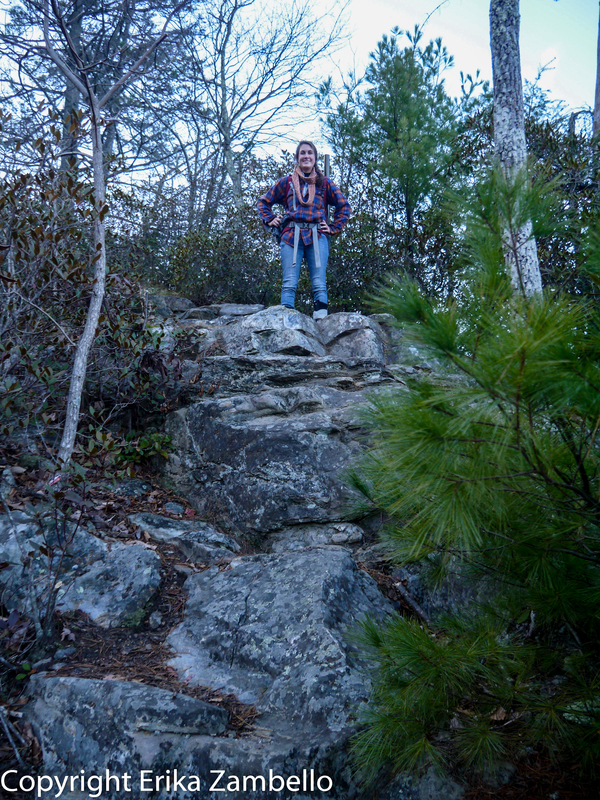 Though the trail was only a mile long, it took nearly forty-five minutes to carefully pick our way down the narrow route, which was covered in leaves and dotted with rocks and boulders. Though climbing down was nerve-wracking – especially because I have never hiked with a pack before – the views were tremendous. One side of the ridge was dominated by the skeletons of hemlock trees, victims of the woolly adelgid invasion. With a sigh of relief, I finally stepped onto flat ground. However, our camping site lay in the center of a ring of rhododendron shrubs, which, though beautiful, was also on the other side of the river. Crossing gingerly – I in rubber boots and Brian barefoot – we eased our way across, narrowly avoiding a few slips and slides that would have landed us and all our gear right in the water. As I was carrying my camera equipment, a wet plunge would have been particularly disastrous. 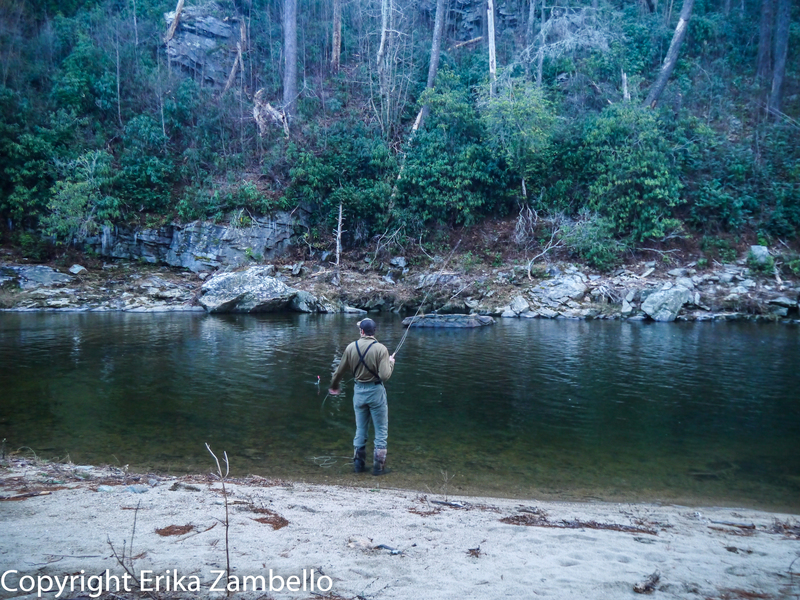 After quickly setting up our campsite, we split off into our own activities, me with my cameras, Brian with his fly-fishing rods. 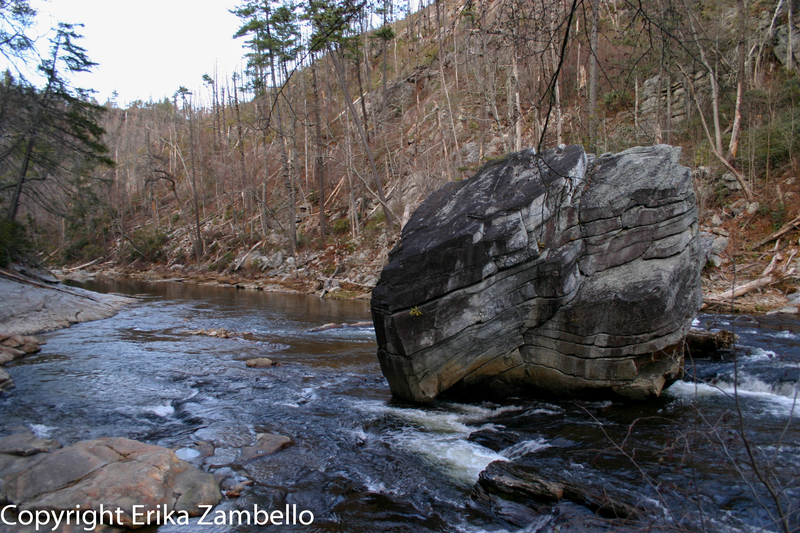 The most notable feature of Linville Gorge, of course, is the water. 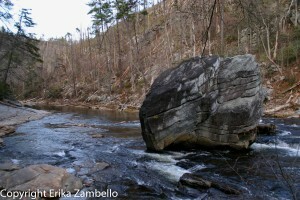 The river has carved out the gorge itself, and still flows quickly and clearly over the rocks worn smooth by the river’s currents. 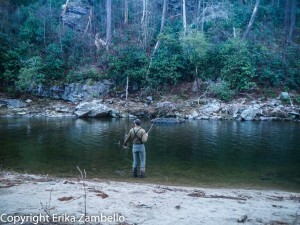 As Brian fished, I explored the rocky edges of the shore. 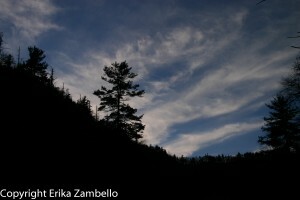 The sun was setting rapidly, muting the colors of the landscape. Still, water is always dynamic, and I found myself taking a multitude of photographs, trying to capture the energy of the river. It wasn’t working. Photos freeze images in time and thus by nature are not dynamic, and so it is no surprise that I was disappointed with my static results. Then suddenly, it hit me. A time-lapse! A time-lapse video compiles photographs all taken a few seconds apart to create the illusion of movement. My camera was too cold to take more than 14 photos in a row, but compiled together and run quickly they still portrayed what I was seeing, the beautiful undulations of water running over stone. The video, featured above, was simple to create and a lot of fun, and I look forward to improving on my first attempt at time-lapse techniques. As darkness grew we made sure to gather firewood, creating a small pile of driftwood pieces next to a large fire circle. Dinner was made up of camp-meal packs, prepared with boiled water from a tiny propane burner. Once the sunlight disappeared the air grew quickly chilly, and before the clock struck 8 p.m. we were in our tent, huddled in sleeping bags. It turns out I’m more afraid of the night than I thought. As I tried to sleep, my ears were on alert for any scuttling, any sound of paws that might indicate an approaching bear. I have lived in Maine my whole life without once fearing black bears, but all the horrible news stories I had ever seen suddenly flashed before my eyes. While I chastised myself for being ridiculous, it still took time to shake my anxious feelings. 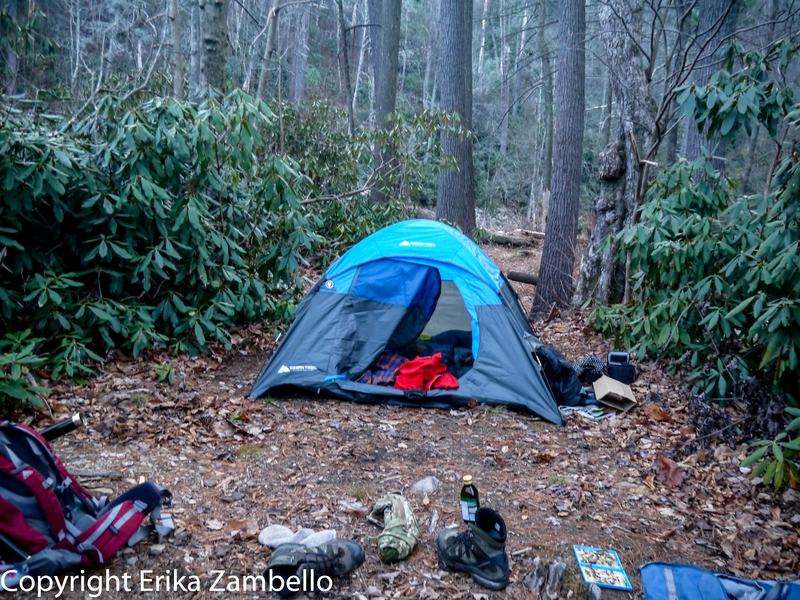 It was only when I finally relaxed that I could appreciate the true beauty of wilderness camping. Other than our own, there were no voices to interrupt the calm, no bottles clanking or car doors slamming or constant zipping of tents. The only sounds we could hear were the rushing of the river and the low whisper of wind through the leafless trees. It was peaceful, and before long I was snoozing. The next morning dawned warmer, but gray, and as we finished packing our belongings the rain began. Normally I would groan at the idea of hiking in the rain, but in the end I was so hot from exercise that I actually welcomed it. 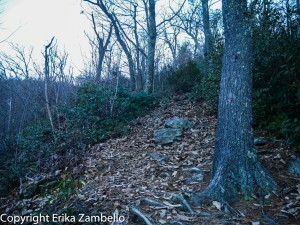 After another shaky river crossing, it was time to climb the ridge once more. Now, I’m not exactly in excellent hiking shape. Two-thirds of the trail required hand over hand climbing as we pulled ourselves up the slope, which was technically difficult as well as exhausting. 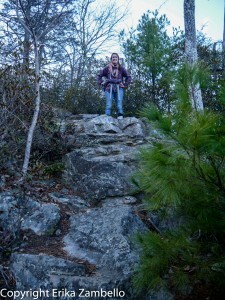 I found I could only walk 50 feet before resting a minute or two, then climbing again. Though I was annoyed at my lack of stamina, the frequent rests allowed us ample opportunity to look for birds and admire the hazy scenery below. A curious Golden-crowned Kinglet approached us and then scurried away, American Robins alighted in a tree in the distance, and a flock of Dark-eyed Juncos hopped on the trail ahead. Eventually, muscles aching, we made it to the top. As soon as I saw the car I felt a rush of pride, of accomplishment. 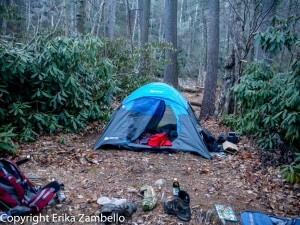 I have always wanted to be at home in the natural environment, and here, in one spontaneous trip, I had taken great strides in both my camping and hiking abilities. I had done it, and now I long to head out again, testing myself and becoming ever more comfortable in the landscapes I love.